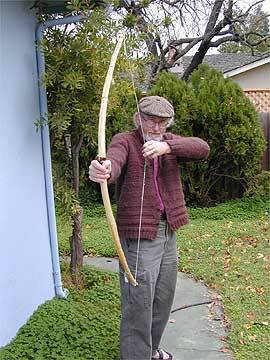 Free Cordage Backed Bow plans - The Inuit used cordage backing for 2 reasons. Very little good bow wood was available so it was imperative that whatever material they used for their bows be backed with sinew. Furthermore it was very difficult to make hide glue under Arctic circle conditions. You have to take hide, hooves, gristle, etc. and boil and boil and boil to make glue. If you have a very limited fuel supply and no big container to boil it in then no glue. As a consequence of circumstances such as this the Inuit became masters (mistresses also) of tying things together. The Inuit bows which I have seen in museums and in photographs are marvels of knotcraft.